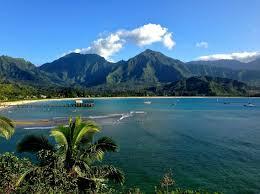 If you want to go to Hawaii and not feel like a tourist then Kauai’s “Hanalei” is the spot. It is know as “The home to the Taro fields”. Large resorts don’t smother this little town, but rather you will find a small church “Wai’oli Huiia” that’s the town’s icon. The beautiful Hanalei River flows through the town and is a great spot for paddle boarding, and the Hanalei pier where the river meets the ocean is known as a place where locals hang for weekend family & friends BBQ. Hanalei is a quaint town and it is surrounded by local markets, bakeries and shops many at the Ching Young Village shopping Center in the heart of the town. While in town you must visit Hanalei Coffee Roasters walk in and smell the aroma of great coffee, Bubba Burgers a local hangout, and the town’s favorite “Wishing Well” with the best shaved ice truck in town and if you want to know the locals secret, then go through the backdoor of the “Hanalei Dolphin Restarant” and you will find a small fish market with the best clam chowder, handmade sushi rolls, and over counter to go items. The other local favorite is the health food store it has a small over the counter in the back of the store with great soups, sandwiches and smoothies. Hanalei is truly Kauai’s Gem. Real Hawaii the old school way ….relaxed,laid back and simply beautiful. 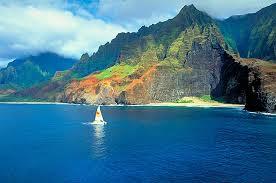 Napali means the cliffs and the only way to see them is by air, hike or boat. The Holo Holo snorkel sail is definitly not to be missed as you board the Leila 50 ft. Catamaran you can see the beauty of the Napali coast, the tour includes a continental breakfast, lunch, drinks and the opportunity to snorkel in the pristine clear waters near the cliffs.